The Global Day of Parents is observed on the 1st of June. The Day was proclaimed by the United Nations General Assembly and honours parents throughout the world. 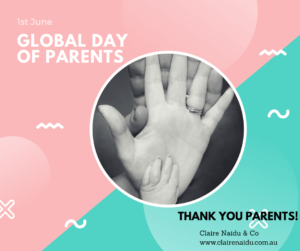 The Global Day provides an opportunity to appreciate all parents in all parts of the world for their selfless commitment to children and their lifelong sacrifice towards nurturing this relationship. Emphasising the critical role of parents in the rearing of children, the Global Day of Parents recognises also that the family has the primary responsibility for the nurturing and protection of children. For the full and harmonious development of their personality, children should grow up in a family environment and in an atmosphere of happiness, love and understanding. Thank you to the parents for the help and assistance you provide!